$33.86 – $8 cash voucher = $25.86!! Christopher Nolan, who has been been compared to Alfred Hitchcock and Stanley Kubrick will get 5 of his directed movies released via a box set: Christopher Nolan Director’s Collection (Blu-ray). 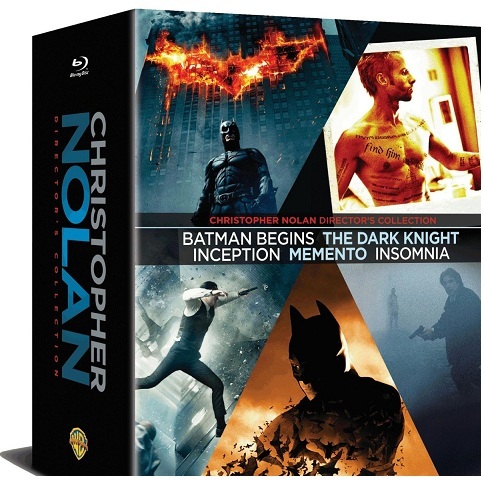 Includes the films Batman Begins, The Dark Knights, Inception, Memento and Insomnia. It’s set to be released on June 26, 2012 with an Amazon pre-order price of $33.86. That’s about $6.60 a movie. These movies have all been released on Blu-ray previously. Unless you already own them all on Blu-ray then $25 (assuming you’ll go see Dark Knight Rises) is not bad for the set which, of course, includes the probably pretty cool 40 page photo book. Some people claim Nolan’s films are nowhere near the caliber of a Kubrick or a Kurosawa. Nolan’s movies have a very subtle ambiguity that is full of intrigue and complex thought. Perhaps people just aren’t picking up on them. Kubrick, Godard, and Kurosawa’s inquiries are more obvious to modern eyes. These classic directors had a simplicity that they couldn’t help but have as precursors. Their inquiries were on a basic philosophical level compared to contemporary knowledge. As a modern director, Nolan can’t make the same kind of grand parables because thought has advanced since then. Detractors may find those type of movies deep and grand, but that’s really just a romantic affection. Nolan’s interests lies in the realm of psychology. Just because some detractors don’t like that topic doesn’t make it less profound a statement. I find Nolan cunning and subversive towards the audience in ways that past directors aren’t. He’s just as experimental as the aforementioned directors. Anyway, this isn’t even a fair comparison to begin with because it’s extremely premature. And, it’s a comparison between different cinematic periods. Those 60,70s directors have already been deemed great by numerous analyses. It’s unfair to judge a working director still early in his career without the same consideration.